Newell Convers Wyeth (October 22, 1882 – October 19, 1945), known as N. C. Wyeth, was an American artist and illustrator. He was the star pupil of Howard Pyle's art school in Wilmington, Delaware and went on to become one of America's greatest illustrators. During the "golden age of illustration" he created nearly 4,000 works over a period from 1903 to 1945. 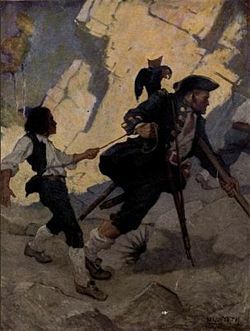 In 1911 he gained national recognition with his illustrations for the book Treasure Island by Robert Louis Stevenson and is probably best remembered for his illustrations of other children's classics done for Scribner's. Wyeth brought to life American stories and themes, from carpetbaggers to Indians. His brilliant use of color and romantic imagery combined with his close attention to historical detail gives his artwork a lasting place in the lexicon of American illustration. He was the father and founder of an artistic dynasty that includes son Andrew and grandson Jamie. N. C. Wyeth and Carolyn B. Bockius were married in April 1906 and, drawn to the pastoral settings and historical ambiance of the "Brandywine River Valley," moved to Chadds Ford, Pennsylvania in 1908. In 1911 they bought 18 acres there and would raise five talented children on that property. His three trips between 1904 and 1906 to the western United States inspired a period which produced illustrations of cowboys and Native Americans that dramatized the Old West. Wyeth's travels were inspired by those of renowned American West artist, Frederic Remington, whom he had admired as a child. Wyeth's pictures of Native Americans from this period show their unique and solitary relationship to nature. One of his most popular was of a woodland Indian, titled, The Moose Call, painted in 1904. Pictures from the "Indian in His Solitude Series" were printed in a 1907 issue of Outing magazine. Like American illustrator Norman Rockwell, Wyeth found early success producing illustrations for The Saturday Evening Post. Only five months after starting in Pyle's art school, a painting of a bucking bronco done for the cover of the February 21st, 1903 magazine was Wyeth's first commission as an illustrator. He also gained national recognition for his illustrations for Scribner's Classic Children's Books including special editions of The Yearling (by Marjorie Kinnan Rawlings), Robinson Crusoe (by Daniel Defoe), The Last of the Mohicans (by James Fenimore Cooper), Kidnapped (by Robert Louis Stevenson), and Robin Hood (by Paul Creswick). His pictures appeared in many of the most popular magazines of the period, such as Century, Harper's Monthly, Ladies' Home Journal, and McClure's. N. C. Wyeth's life and career were tragically cut short when he and his grandson (Nathaniel C. Wyeth's son) were killed in a car accident at a railway crossing near his Chadds Ford home in 1945. He used himself as a model because he felt that growing up on a farm gave him a sense of bodily action—how the body looks and how it moves. Through the sheer power of his imagination he put himself into the scenes of his stories, whether it be Sherwood Forest (Robin Hood) or King Arthur's Court. As head of the Wyeth family of painters who live and work in picturesque Chadds Ford, Pennsylvania, his life is "larger than his accomplishments." He is the father of Andrew Wyeth, Henriette Wyeth Hurd, Carolyn Wyeth, Ann Wyeth McCoy, and Nathaniel C. Wyeth. Andrew, Henriette, and Carolyn became artists as well. Ann became an artist and composer. Nathaniel became an engineer for DuPont. Henriette and Ann married two of N.C.'s protegees, Peter Hurd and John W. McCoy. 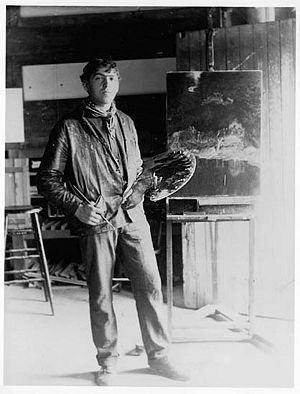 N. C. Wyeth is the grandfather of artist Jamie Wyeth and musician Howard Wyeth. One of largest single murals in the United States, painted in 1932, is Apotheosis of the Family, which contains likenesses of Wyeth's own family members. It is 19 feet high by 60 feet long and mounted in five sections. It spans the entire south wall of the Wilmington Savings Fund Society Building in Wilmington, Delaware. In a 2002 episode of the TV show Antiques Roadshow, a Wyeth painting in excellent condition, believed to be titled When He Comes He Shall Rule the World, was appraised to be worth as much as $250,000. The painting was done to illustrate a story in Harper's Monthly magazine called The Lost Boy, by Henry van Dyke. Significant public collections of Wyeth's work are on display at the Brandywine River Museum in Chadds Ford and the Farnsworth Art Museum in Rockland, Maine. ↑ Newell Convers Wyeth Barewalls.com. Retrieved June 20, 2007. ↑ Gopnik, Adam (November 15 1998). "Pictures Great," His Publisher Told Him, review of N. C. Wyeth by David Michaelis. New York Times. Retrieved February 18, 2007. ↑ barewalls.com (1996-2005). Newell Convers Wyeth. Retrieved February 21, 2007. ↑ [http://www.pbs.org/wgbh/pages/roadshow/series/highlights/2002/indianapolis/indianapolis.html Broadcast Highlights] PBS.org. Retrieved June 20, 2007. 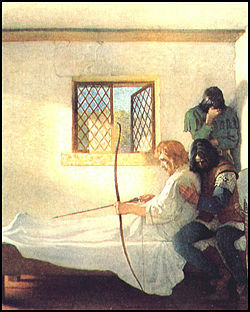 N.C. Wyeth, JVJ Publishing Illustrators. 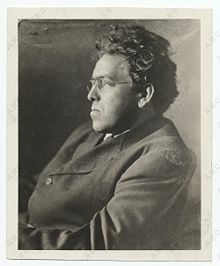 History of "N. C. Wyeth"
This page was last modified on 2 November 2018, at 19:52.